I don’t know about you guys, but I totally have internet crushes. When I find a blog I like, I fall hard and I fall fast. I can easily spend hours that should be spent doing something productive going way, way back into the archives until I get that satisfying feeling of reaching someone’s first ever post. I’ve done it far too many times to admit, but I confess I did it with Izy’s gorgeous site, Top with Cinnamon and it was so, so worth it. In case you’re interested, her first post ever was for zucchini bread. 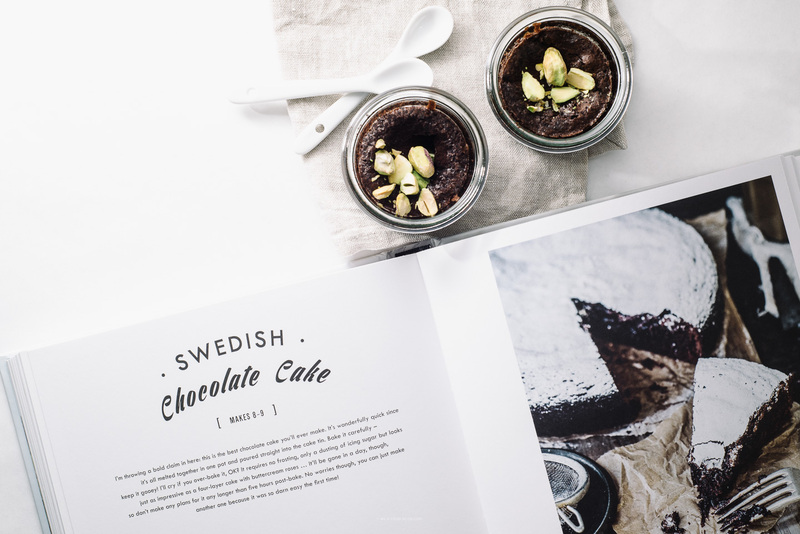 Her third post was for Swedish chocolate cake, so I thought it was fitting that I would make her updated version of Swedish chocolate cake – found in her brand-new beautiful book, Top with Cinnamon. I’ve been looking forward to this book for a while. There’s something about Izy’s real life enthusiasm that translates so well to the written word. I had the immense pleasure of meeting her in real life at the Saveur awards in May, and guys, this girl is the real deal. She’s only 18, but damn, I want to be her when I grow up. Izy’s book is definitely one of those winners that you curl up with on the couch, your feet wrapped up in a fluffy blanket and a big mug o’milky tea in hand. Even better is if you have a slice (or jar) of cake that you can snack on too. These guys whip in a flash. I love that they’re essentially a one bowl (pot, really) chocolate cake. If you have a kitchen scale, here’s the time to use it. I love using scales when baking. No measuring cups means less washing up, which is always a bonus. I made these in little single serving jars, which totally defeats the less washing up, but I couldn’t resist the allure of minifying. I also added a bit of cinnamon – it was dual purpose, a touch of warmth and a nod to Izy’s love of cinnamon. 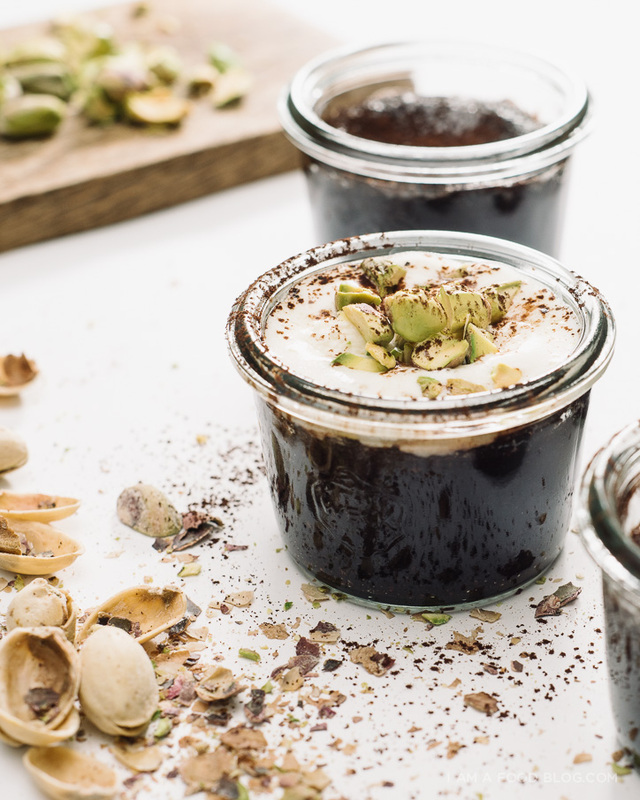 The softly whipped cream and chopped pistachios were added for crunch and contrast, but aren’t needed. On it’s own, this cake is gooey, chocolate-y, and absolutely delicious. Congrats Izy! She’s a beaut! Preheat the oven to 350°F. If making a round cake, lightly grease and flour a deep 7 inch cake pan. 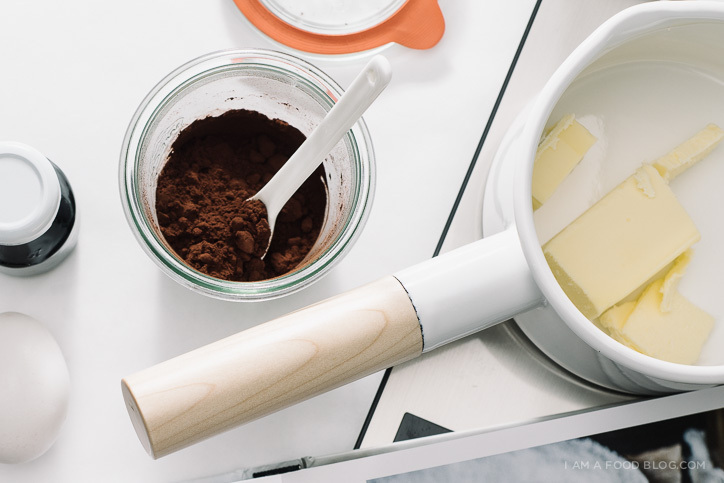 If using mini jars, light grease and flour 12 oven safe jars. I used these ones. Melt the butter in a medium saucepan. Remove from the heat and stir in the cocoa, sugar, vanilla, flour, cinnamon, and eggs until well mixed. Pour the batter into the pan or evenly divide amongst the jars. Bake the 7 inch cake until set around the edges, but gooey in the middle, 20-30 minutes. Bake the minis for 10-15 minutes. Cool for 20 minutes, dust with icing sugar if using, and top with whipped cream and pistachios, if desired. Enjoy warm! 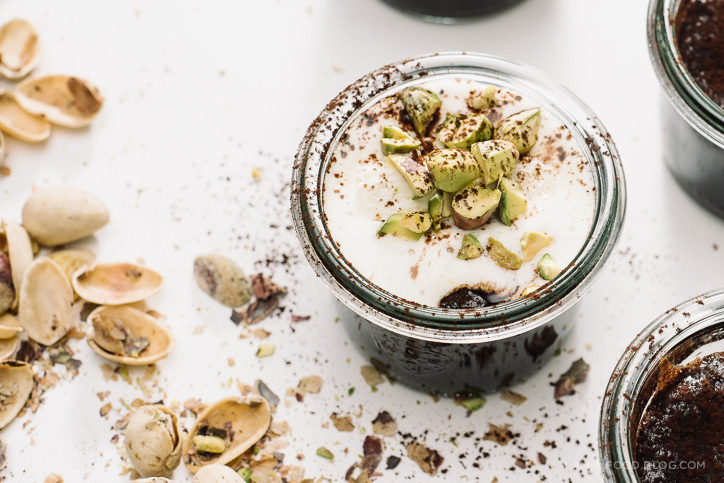 These are too cute – I’m a lover of anything mini and the pistachios must add great flavour and crunch! I’m a fellow lover of izy’s gorgeous blog so I know exactly how you feel Stephanie! These cute little mini cakes are awesome sounding! I’ve been seeing this recipe around the blogisphere and love your take on it! I love the touch of pistachios up top! Haha. I looove them in little jars. SO CUTE. I love the banner photo with a view of her book and the cakes. And cakes in jars are just too cute! These look utterly amazing. I wonder how they’d be with some cardamom added? Must try it both ways! It looks amazing! I gotta try this at home!! Izy is so talented, but so are you! Tons of food bloggers wish they could grow up to be like you too hah! I love your adaptation for her recipe. 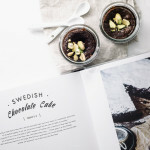 Her website always such beautiful photos so it’s a no brainer that her cookbook would just be as gorgeous. These look truly decadent & I’ll keep this recipe in mind when thinking of making a delicious chocolate cake. Momma loves her chocolate & … she tends to buy those out of the box ones, bleeeghk. Beautiful photos as usual, woman! Love all of your posts! These look and sound so delicious. I love that blog. I totally have a girl crush on Izy too! Her photos, recipes, and enthusiasm are wonderful and contagious! These are just way too cute. 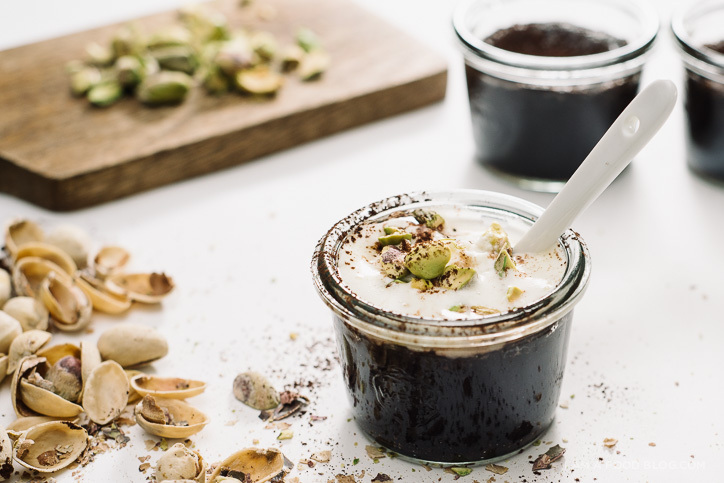 I love the pistachios on top – extra crunch is never a bad idea in my book. And I totally know what you mean about reading back through blog archives. That may or may not be one of my favourite guilty pleasures/procrastination techniques. Love your minified version of this fabulous cake! Your photography always blows me away. This cake recipe from her book is sooo popular around the Internet! Her book is pretty high on my wish list. this cake looks delicious, can’t wait to try it! These are absolutely drop dead gorgeous, just happened upon your website, and also introduced to Izzy’s. Thanks! Will definitely be attempting to bake these little babies soon. Great photography! A hint of cinnamon with chocolate sounds delicious! I love small pots you put them in, it’s a perfect size snack. I wanted to make these but the recipe says salted butter. Just wanted to make sure it’s a typo and that I should use unsalted! Thanks for the recipe, they look great! the recipe calls for salted because there’s no salt in the rest of the recipe. if you only have unsalted, you can add a tiny pinch of salt to the batter. hope that helps!